Kyality: a blog about music, movies, tv, cars and design: Mach GoGoGo in HD. In the 1960’s Japanese animation pioneer Tatsuo Yoshida created the exciting animated series Mach GoGoGo. It was insanely successful and was re-dubbed for US television in 1967 under the name that we’ve grown to know and love: Speed Racer. Luckily, throughout my high school years the Cartoon Network re-released the series to an entirely new generation of anime-lovin’ gearheads. About six months ago, I scored the first season of Speed Racer on DVD. Now the Kyality Kids enjoy the adventures of Speed, Trixie, Spritle, Chim-Chim, and of course the Mach 5. And they love to sing: Go! Speed Racer, Go! Speed Racer, Go! Speed Racer, Go-oh! Yeah, it’s pretty awesome. 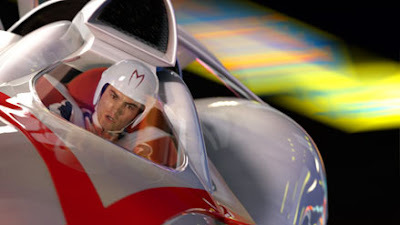 This summer, directing their first feature since the ridiculous Matrix sequels, Larry and Andy Wachowski are bringing Speed Racer to the big screen. And with rumors of an IMAX version, it may be hitting the really big screen as well. Even though the Matrix sequels were a joke, the Wachowski brothers did write and produce V for Vendetta last year—which was awesome—so I’m pretty excited for this. Not to mention, the trailers for this flick are off the hizzle. I’m most impressed with the production design of the Mach 5 itself. It’s dead on. I really don’t mind the filmmakers taking liberties with the time and place of the storyline. But they had to stay true to the design of the Mach 5—and they did. This car looks amazing and a working version wrapped in a massive set of Yokohama’s is making the rounds on the Auto Show circuit. Road & Track even test-drove this hot rod. I'm pretty sure that Normality and crew caught the Mach 5 at the NYAS. 1) Turn down the lights. 2) Crank up the volume on the speakers. 4) Select the proper QuickTime HD resolution. 5) Hit “Command-F” for Full Screen, grab some popcorn and enjoy. 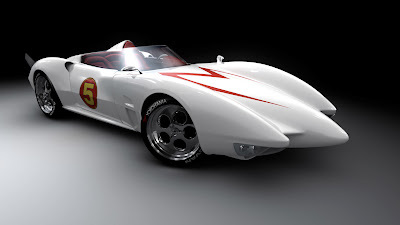 Quick Update: Apparently the Mach 5 will be taking a back seat to the new Mach 6, which will apparently be introduced throughout the course of the new movie. The Mach 6 is the one-seater pictured in my post with Speed behind the wheel. Okay, So Maybe I Overreacted. Beware Blogosphere. Deconstruckt 2.0 Lives.